Built-up is a type of roofing mostly used for flat roofs. It has been in the industry for over 100 years, and is preferred by commercial property owners because of its features and benefits. Innovative Roofing and Siding, your trusted roofing company in Knoxville, TN, discusses this further. 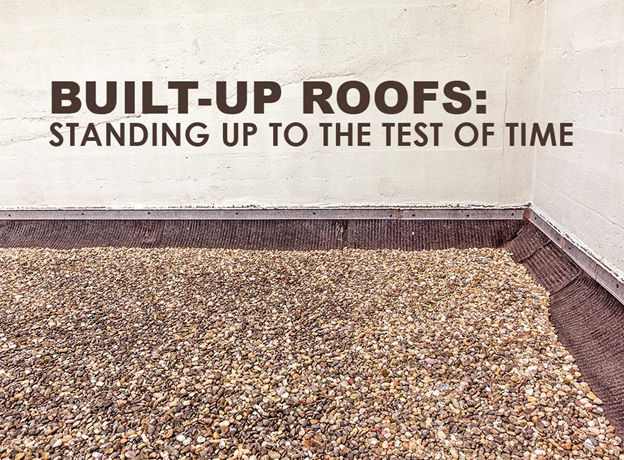 Built-up roofs consist of multiple layers of asphalt that are alternated with ply sheets. We apply them over the roof deck and insulation. The layers create a watertight barrier that protects your property for years. If the top layer endures damage, the second layer stops water and other elements from entering the property. The layers also create a rigid surface, which allows room for solar panels, roof gardens, or outdoor recreational spaces. We recommend this type of commercial roofing in Knoxville, TN, because of its durability and outstanding performance against the elements. Built-up roofs are also energy-efficient options because the roofing membrane comes with insulation. This results in a higher R-value, which also means better thermal performance. Built-up roofing can also withstand strong winds. The layers adhere to each other, forming a rigid structure without the need for fasteners. This results in less stress points and increased wind resistance. Built-up roofs also have a UL Class A fire rating, which is the best in the industry. This roofing type is also ideal for property owners looking for a low-maintenance roof. Its durability ensures that you will never need to worry about repairs due to damage. That said, the Asphalt Roofing Manufacturers Association recommends annual inspection for the system. For quality built-up roofing for your commercial property, you can trust Innovative Roofing and Siding. We specialize in built-up roofs and other types of commercial roofing systems. We guarantee quality workmanship, on-time service, and affordable prices. We can also help you with roof repair in Knoxville, TN. Take the proactive step towards a better property with our roofing system. Call us at (865) 688-2888 to learn more about our options. You can also request for a free quote when you fill out our form.